Wow, That’s a Lot of Cows! Before we launch into VINE's 15th anniversary celebrations next year, let’s pause for a moment to recognize the breath-taking bovine boom of the past four years. With the arrival of former “dairy” cow Be last month, VINE Sanctuary reached its capacity of 40 cows. You read that right: 40 cows. We can hardly believe it either. Only four years ago, the first two cows arrived at the “up the hill” property onto which we had expanded after ten years of offering refuge only to birds (and the occasional barn cat or rabbit). So, before we launch into our 15th anniversary celebrations next year, let’s pause for a moment to recognize the breath-taking bovine boom of the past four years. 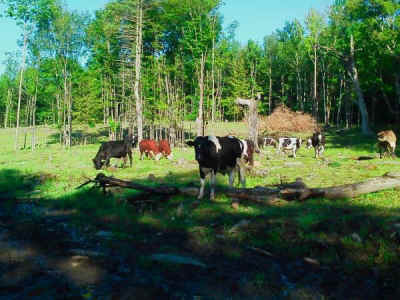 Front Pasture - The gentle slopes of the front pasture are reserved for elders, calves, and cows with special needs. Autumn and her friend Rose came to VINE after many years of exploitation at a mid-sized, ostensibly humane, dairy. Autumn is the elder and more outgoing of the two, with an independent spirit and a perpetual glint in her eye. Rose is very sweet but somewhat shy, so we have to be mindful to make sure she gets her fair share of treats and attention. Be came to VINE from a dairy that discarded her after several forced pregnancies resulted in miscarriages or still births. Bold and bossy with other cows but fearful of people, Be may be joining the back pasture crew once she develops more muscle tone. Coco was a discard of the dairy industry who came to VINE, along with his friend Lamby, from a private home that could no longer afford their care. Undersized and introverted, Coco loves attention from trusted people and spending time with trusted friends but is wary of both human and nonhuman strangers. Cocoa and her brother Norman came to VINE from another sanctuary and are now the elder matriarch and patriarch of our herd. A dairy cow who was never allowed to keep her own calves, Cocoa lavishes attention on calves at the sanctuary. Redeemed from being made into veal as a calf, Norman has spent his entire life at sanctuaries. Gertrude is a survivor of dairying who came to VINE from a smaller Vermont sanctuary that could no longer afford her care. Solid and sociable, Gertrude contributes a low-key vibe of friendly equanimity to the VINE herd. Jan gave birth to her son Justin after jumping a “beef” farm fence and escaping into the forest. Both made their way to Farm Sanctuary, who placed them with VINE. As might be expected from that story, Jan is strong-willed and fiercely protective of her son. Quietly perceptive, Justin enjoys bird-watching at the pigeon aviary and playing with the other calves. Maddox came to VINE when just four days old, after being discarded by a dairy. Outgoing and energetic, year-old Maddox is now the leader of the calf crew but also enjoys solitary walks through the woods. His perpetual project is figuring out ways to steal emu food. Melody would have been destined to a life of violation and grief as a dairy cow but got lucky and caught pneumonia, which led her to be discarded while still a calf. She will always be undersized and has some scarring on her lungs, but has made a full recovery and enjoys tearing around the pasture with the other calves. An extraordinarily self-possessed calf, Melody also often socializes with the adult cows, with whom she interacts as if they were peers. Solstice and her son Equinox came to VINE from a dairy on which she had been exploited until an injury to her udder made mechanical milking impossible. Equinox is confident and outgoing and often repays the affection that everyone here showered on him as a calf. Now that he is older, Solstice has become less focused on his care and we are eager to see what she will now choose to do with her time. Back (Side) Pasture The back (side) pasture is empty in icy months but, from spring through fall, is the stomping grounds of cows who are more hardy than those in the front pasture but aren’t (yet) hardy enough for the way-back (not to mention way-way back or “way the heck back there”) pastures. Blake and her friend Addison are the survivors of a group of four elder dairy cows who were seized by local authorities due to extreme neglect, including starvation. Steady and serious Blake was the leader of that group. Standoffish Addison is a loner who prefers her own company, even to that of other cows. Both love the hilly and wooded side pasture so much that it takes quite a bit of coaxing to lure them down to the front pasture for the winter months. Buddy is a VINE volunteer who makes it his business to greet all newcomers and also to offer care to any cow who is sad or on the outs with others. Confined all alone in a barn for more than a year, Buddy emerged from his solitary captivity with a deep appreciation for relationships. He was most recently spotted using his top teeth to pull a tick from Duke’s neck. Duke is an adolescent cow who arrived with the Jersey 5 (see below) but decided that he would prefer to forge a new social group upon coming to VINE. While extremely cow-social, Duke doesn’t choose to interact with people very much, so we can’t say much about his personality. Emma and her “brother” Linus had been attractions at a petting zoo, where the owners only fed the calves if visitors were there to watch. That early brush with starvation permanently stunted their growth, Emma more so than Linus. Both are playful and sociable with an undercurrent of sadness. 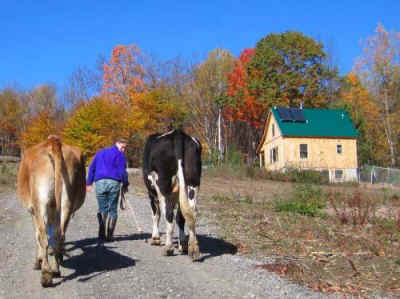 Howie was saved from being made into veal by a private couple who eventually were unable to afford the costs of maintaining a giant-sized cow. (People often don’t realize how large those cute little calves eventually grow.) Although he had been raised without contact with other cows, he has quickly adapted to herd life since coming to VINE earlier this year. Jack also had been saved from being made into veal by a couple who eventually could no longer care for him. Friendly and assertive, Jack WILL eat your lunch if you look away for a moment. Easygoing with other cows, Jack has made friends with Buddy, Rupie, and Bobby since shifting pastures earlier this year. Princess endured forced breeding at a Vermont college “farm” program before her aggressive behavior led the college to sell her off. A student bought and brought her to sanctuary rather than allow her to be slaughtered. We have not seen such aggressive behavior from her here at the sanctuary. Seeing her flinch response to certain gestures led us to wonder whether she had been hit and if this was the cause of that behavior. During her first months here, Princess was withdrawn and standoffish, but she has since made friends with a few favorites. She particularly dotes on Linus, who seems to return the affection. Princess also has her favorite people, who she walks to greet and allows to cuddle her. Rupie and his friend Bobby came to VINE from the same small Vermont sanctuary as Gertrude (see above), who is Rupie’s mother. Taking in animals from other sanctuaries reminds us of how careful we must be to maintain our financial ability to care for everybody. Way Back Pastures In addition to the side/back pasture, the back barn opens out into a series of pastures we call by various names, including “way back” and “way way back” and “way the heck back there.” These mountainous pastures include cleared land, dense forest, and lightly wooded areas. This rocky terrain (the steepest parts of which we block off in the icy months) is heavenly but only appropriate for the hardiest cows. Brutus and his friend Napoleon had been hand-raised as pets and are still extremely people-friendly. Napoleon is outgoing, often coming up to greet visitors, while Brutus tends to hang back and wait to be noticed. Clancy and his friend Vito were the very first cows to arrive at VINE. Now they enjoy hiking the hills in the company of the hardy herd. Clover had been scheduled to be made into “beef” but was redeemed by a kind-hearted woman who then was unable to care for her. Shy with people but extremely assertive with cows, Clover has no trouble holding her own within the hardy back pasture herd. The Dynamic Duo, Poncho and Jasper, came to VINE as calves who had been tied to a tractor and left to starve by a small-scale dairy farmer. Both are bright and high-spirited. Poncho is charismatic while Jasper is more thoughtful. Together, they make a formidable duo. The Jersey Five Minus One include Sumo and Spreckles along with Athena and Elektra. They had been scheduled to be sent to a slaughterhouse when the family who kept them as pets could no longer afford their care, but Facebook intervened and they came to VINE instead. Each has found new friends among the herd, but they also still spend time together. Luna and her daughters Orchid and Oryx survived starvation at a small-scale “beef” farm. When authorities arrived to seize them, Luna was so starved that she had begun to digest her own body but was still nursing not only her own daughter but also the daughter of a mother who had become too weak to nurse. Besides being nurturing, Luna is strong-willed and independent. Her birth daughter Orchid is friendly and placid while her adopted daughter Oryx is our adolescent wild child, who won’t hesitate to jump a fence if the grass is greener on the other side. All three like to forage in our steepest and most forested pasturage. Milkshake Moo and Midnight Moon also survived cruelty and neglect at the kind of small-scale farm that locavores mistakenly presume to be kind. Immediately seized and nursed back to health by sanctuary folks, Milkshake eagerly seeks out and appreciates human contact. Left on the farm while the court case wound through the legal system, Midnight Moon is more shy of people but extremely attached to other cows, becoming visibly (and audibly) upset whenever anybody else is ailing. "Yum, that smells like fresh-cut hay!" Wow. That’s a lot of cows. They eat a lot of hay. 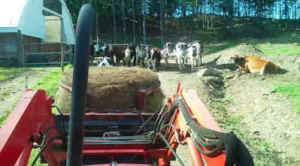 We also must pay staff members to maintain their pastures, clean their barns and check on their well-being every day. Some, like Norman and Autumn, require daily medication or supplemental nutrition. PLEASE donate to VINE (Vegan is the Next Evolution) Sanctuary!